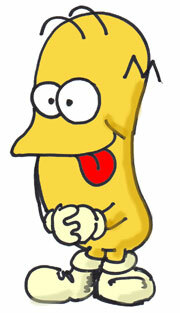 SIMPSONS fans will no doubt love it and pet it and call it Krusty. Newcomers will laugh and marvel at this old-fashioned “cartooning” thing. THE SIMPSONS MOVIE is pretty much a SIMPSONS television episode. No better, no worse. Just longer. Which means it is very good – but we are left pondering the fiscal wisdom of turning this longest running American sitcom ever (first aired Dec 1989) into a feature film that plays like a TV viewing without the pee breaks. What Would Homer Do?… D’oh! Though Trey Parker’s and Matt Stone’s SOUTH PARK has long usurped THE SIMPSONS as the zenith of biting political and sociological satire, THE SIMPSONS MOVIE tries its best to bite back, aiming at a tender societal bone – the environment. As he caused the en-doming of Springfield, it falls to Homer to free the town with some inspired accidents and contrived character arcing. 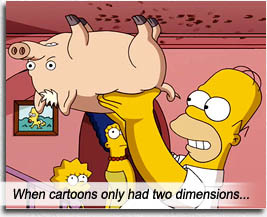 Created by Matt Groening, written by – well, everyone – and directed by David Silverman (co-director, MONSTERS, INC., 2001), unlike Trey Parker’s and Matt Stone’s SOUTH PARK: BIGGER, LONGER AND UNCUT (which stepped up from its episodic feel and made a hell of a feature film) THE SIMPSONS MOVIE finds Bart, Lisa, Marge Simpson and all the other much-loved denizens of Springfield trapped in episodic hell, business as usual. No better, no worse. Just longer. Writers: James L. Brooks, Matt Groening, Al Jean, Ian Maxtone-Graham, George Meyer, David Mirkin, Mike Reiss, Mike Scully, Matt Selman, John Swartzwelder, Jon Vitti, Joel Cohen, John Frink, Tim Long, Michael Price, Sam Simon. Starring: Dan Castellaneta, Julie Kavner, Nancy Cartwright, Yeardley Smith, Hank Azaria, Harry Shearer, Pamela Hayden, Tress MacNeille, Albert Brooks.